The Dalton Soft sofa born from the collaboration between the designers Spessotto & Agnoletto, produced by Ditre Italia, company with a long experience in the made in Italy upholstered furniture manufacture. Spessotto & Agnoletto conceived a system of sectional sofas characterized by an essential and elegant design, perfect to value your living area with modern style and lightness. 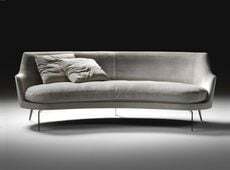 Ditre Italia realizes the Dalton Soft sofa covered in fabric, completely removable, or in leather and eco- leather. You can enrich the Dalton Soft sofa and further increase the comfortable seat, with a series of cushions available in various sizes. Ditre Italy offers the opportunity to choose the finish of the feet between chrome, nickel chromed or oxidized iron.